The Dark Ranger: Draft beer, not people! It is only appropriate to insert a 'little politics' and my desire to be holding a large pint of beer at The Garden on the eve of the New York Rangers heading from the training facilities to the United States Military West Point Academy. They will be practicing a series of team building exercises and "living in cots" for a couple of days to bond as disciplined hockey men. 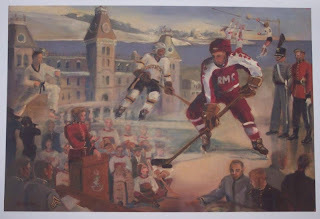 If you recall, Coach Tom Renney sent the Rangers to this prestigious U.S. Army Academy post-lockout two seasons ago, which led to the Blueshirts dominating the division (though due to injuries they were knocked out by the Devils), and making the playoffs for the first time in, I believe, nine years. It worked then. May it work now. The expectations are huge in New York City for this highly publicized hockey franchise, with Madison Square Garden touting that every single ticket sold-out for all eighty two games - the first time ever for all remaining tickets to be sold in one hour. Tickets prices are skyrocketing and season ticket holders (like me) now possess some of the more valuable tickets for a New York team. Regular season tickets, on questionable sites such as Stubhub and Ticketmaster Auctions, are pricing at 200% the face value. Who ever thought hockey could only be afforded by the financial elite? * Twelve players have been cut and transferred back to Hartford camp: goalies Chris Holt and Matt Zaba; defensemen Clayton Barthel, Corey Potter, and Jake Taylor; forwards Joe Barnes, Alex Bourret, Brodie Dupont, Mitch Fritz, Bruce Graham, Greg Moore, and Jordan Owens. * Darius Kasparaitus - subject of an earlier blog, the Rangers cannot afford and apparently word on the street is that he may be a Buffalo Sabre over the next week or so. Agents are talking and that means the trading season is also beginning to buzz. * Robert Esche - is in secret discussions with Glen Sather and management to make him a bone fide backup goalie to Henrik Lundquist. Salary room is now an issue, but Esche's history with Philly last year may make him eligible for a low salary with 'bonuses for play'. Infamous Eckland - the secret hockey blogger - has discussed it, but this is an active consideration in the NY Rangers management. Apparently, Stephen Valiquette has not impressed the brass to solidify his 'second goalie status to a cup' contender. Oh, right!THAT hip check is outstanding...he could find a new life elsewhere. I don"t like him as a Sabre. 1) We agree with Scotty that any trade of Kasper should preferably be to a western team. Esche is a good choice and very much in line with a Kevin Weekes. The Rangers NEED someone like Esche if they truly want to make run at the cup Lundquist will not play all games. Al Montoya apparently is showing some signs at camp, but I agree with fauxrumors that Esche is the better choice. Re: Kasp, we all like the guy, that hip check is rare in the NHL and no longer fits in with the new NHL, so good luck to you Darius. Buffalo would be fine, just don't end up in the Atlantic division. faux, $3 million a year for Darius to play in the AHL hurts. We definitely need to free up some cap room. This is a great time - lots of emails, traffic to the site and people are starting to get excited.